Biga Pit is an open pit mining area located in Barangay Biga, Toledo City, Cebu Province, the Philippines. This interesting decommissioned copper mining pit has been attracting people of various ages due to its view. Toledo City, where this mining site belongs to, was formerly called Pueblo Hinulawan long before it turned into a popular source of minerals during the Spanish period. Hinulawan was then renamed into Toledo by Spanish officials after one of the provinces in Spain. During the tenure of President Emilio Aguinaldo, Toledo became a district of Cebu Province. Later on, the Act 119 which was signed by Governor Francis Burton Harrison in December 1919 turned Toledo into a fully-functioning town. Mining activities in the area started in 1955 which eventually promoted local business, attracted more residents, more job opportunities, and has been providing locals boost to their local economy as well as for the province as a whole. The copper mining in Toledo is the biggest one known in the Philippines supplying copper ores to local companies as well as exporting them to other countries. 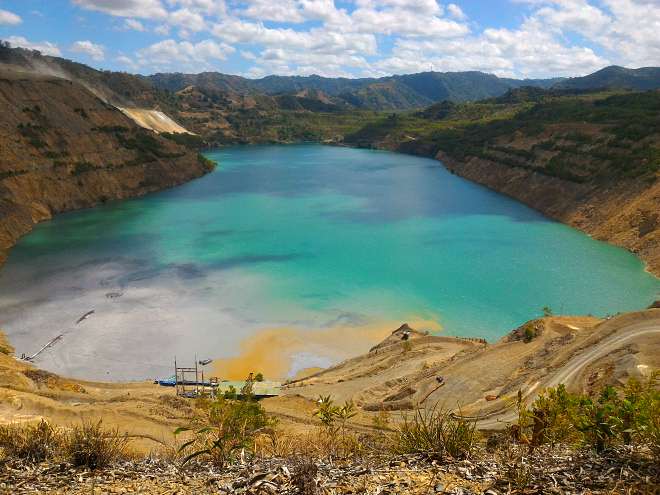 Atlas Consolidated Mining and Development Corporation, under which Carmen Copper Corporation operates as its subsidiary, is using the Biga Pit as its tailings storage facility. According to its website, the turquoise water is liveable by various creatures including fish such as Tilapia. Basically, Biga Pit in Toledo is not a place for active adventures but only for educational purposes such as trips by schools and other educational institutions that study any related fields including geo-science. No, the water in the pit is probably not advisable for swimming. The site is attracting not only students and researchers but also interested individuals due to its interesting mining view. At times, the site is used to detonate bombs recovered from various places in the province. For example, a World War II bombs that were discovered in Kawit Island in 2012 were detonated inside Biga Pit as it is the safest place to do it in Cebu Province. Of course, viewing sites like lakes and mining places like Biga is fantastic when viewed from the higher grounds. Besides, one is not allowed entrance to the pit itself as it is not safe. By the way, make sure that you contacted in advance the authorities of the site so that you will be allowed to enter. Biga Pit is one of the three open mining pits of Toledo copper mines. The other two mine pits are Carmen and Lutopan pits. Among the three, only Carmen Pit is still active which produces an average of 42 thousand dry metric tonnes of copper daily (source: sunstar.com/2017-07-01). Lutopan Pit, which is estimated to be holding ore reserves of around 180 metric tonnes (sunstar.com), has its mining activities suspended due to some reasons and will be resumed in 2021. Among the three, as aforementioned, Biga Pit is the largest but has been decommissioned for some time now. It is estimated to have been operating in the past 11 years as the mine tailings storage facility. Tailings are the materials left after the minerals are separated from the copper ores. Although the turquoise water looks great, you will find underneath are tonnes of tailings. If you did not know, the Philippine environment law requires mining sites like these to be rehabilitated by planting organic plants especially trees with hope to reduce nature’s losses. Since most mining sites are expansive, reforestation is the required activity. It seems that Carmen Copper Company is on its way to showcasing a barren pit into a green scenery. As a subsidiary of Atlas Consolidated Mining and Development Corporation, Carmen Copper is among the thirteen metallic mining entities that passed the Department of Environment and Natural Resources (DENR)’s latest evaluation (sunstar.com). Carmen Copper Corporation is exclusively operating the Toledo mine sites that include 1,676 hectares in total. These mining sites are under the mineral property of Atlas Mining Corporation which roughly stands 5,000 hectares in total. The company aims to become a model for responsible mining by implementing various programmes including reforestation in ‘mined-out areas,’ monitoring mine effluents and metal contents in the rivers, and ensuring awareness on environmental safety of its employees. An official of the company mentioned that it has planted over 2 million tree seedlings in over 1 thousand hectares and have given away over 400 thousand seedlings since 2010. Such activities have earned them the Best Mining Forest Award for the past six years (sunstar.com 2017-07-01), among other awards. Sunstar Cebu also published saying that the company has intensified its programs as required by the Mining Act. On programs related to environmental protection and enhancement, the company is said to have spent 2.23 billion Philippine pesos since 2009 – including programs for rehabilitation, regeneration, reforestation of the mines sites, among other programs. As required by mining law, companies have to set aside 1.5% of their annual operating costs for community projects. A high percentage of the amount goes to social development and management program, while some amounts are for the development of mining technology and public awareness raising and education. Barangays Biga, Lutopan, Don Andres Soriano, and Loay are the recipients of Carmen Copper Company’s social development programs. (Source: SunStar Philippines). Once you are in Toledo City, which is about two hours by public transport from Cebu City, you can easily take any transport to the area. In Cebu City, head to Cebu South Bus Terminal and take any bus bound for Toledo City. As you arrive in Toledo, inform the driver to drop you off near the public fish market where you can take a motorcycle to the entrance of Carmen Copper Corporation. Besides buses, you can also take taxis, V-Hires or ride your private vehicle and head straight to the entrance area of the site. Below are some of the famous sites and places that you can explore while in the Municipality of Toledo or at its City. Thanks for visiting this page. Please, drop by again to find more information and updates.